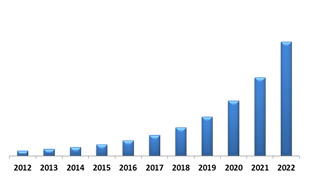 According to a new report Global Biometric ATM Market, published by KBV research, The global Biometric ATM market is expected to attain a market value of USD 1,960.0 million by 2022, at a CAGR of 39.6% during the forecast period, 2016-2022. Biometric ATM is referred to as self-service machines that use biometric technology to authenticate customers or bank account holders and allow them to withdraw cash from the ATMs. Physiological and behavioural characteristics are the two factors used for authenticating account holders at the ATM's. In 2014, physiological characteristics segment dominated the global biometric ATM market. The segment is estimated to generate revenue of USD 1,638.2 million by 2022, at a CAGR of 40.4% during the forecast period (2016 - 2022). Increasing fraud cases while conducting cash transaction through the ATMs has forced the banking sector to adopt advanced authentication system such as biometric technology in the ATMs. Financial institutions have started adopting biometric technology for strengthening and securing their infrastructure and protect customers' banking details. Consumers in India and other emerging countries are positive about the use of biometric scanning to secure bank transactions. In addition, rural consumers in the developing and developed countries are readily accepting such technologies owing to rising ATM card frauds and other security concerns. Increasing use of ATMs to make cash transactions is one of the major drivers for the growth of ATMs. As per RBR, globally, the number of ATMs is expected to increase by approximately 42%, and would reach 3.2 million by the end of 2016. In addition, the total cash withdrawal from ATMs is expected to reach USD 128 billion by 2020. In addition, increasing urban population due to industrialization, especially in the Asia-Pacific region has increased the overall annual disposable income of individuals within this region, and in turn has increased the purchasing power. These factors also contribute to a steady rise in the use of ATMs for cash withdrawal. Based on authentication type, the market is segmented into fingerprint, iris, vein, palm, face, voice recognition and others (signature, writing pattern and keystroke). In 2014, fingerprint recognition technique dominated the global biometric ATM authentication type segment, with maximum market share in terms of revenue. However, voice recognition would witness fastest growth of 45.3% during the forecast period (2016-2022). Further, for better analysis and understanding the market penetration of biometric ATM, the market is divided into different geographies and countries including North America (U.S., Canada, Mexico and Others), Europe (Germany, U.K., France, Russia, Spain, Italy and Others), Asia-Pacific (China, Japan, India, South Korea, Singapore, Malaysia and Others) and LAMEA (UAE, Saudi Arabia, Brazil, Argentina, South Africa, Nigeria and Others). 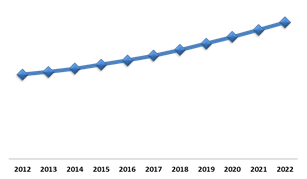 In 2014, Asia-Pacific dominated the global biometric ATM market, holding approximately 47.7% share in terms of revenue. 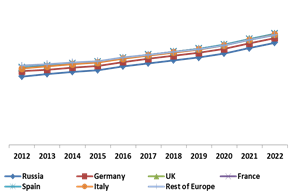 Increased adoption of biometric authentication system in the ATMs in countries such as Japan, India and China has helped the region to dominate the global market. Some of the major companies profiled in the global biometric ATM market are Siemens AG, Hitachi Ltd., Magal Security Systems, Ltd., Cisco Systems, Inc., Robert Bosch GmbH, Tyco International Plc, Honeywell International, Inc., Panasonic Corporation, Diebold Inc. and Glory ltd.